The June 4, 2015 issue of the Troy Times-Tribune is off the presses and on its way to subscribers and newsstands! 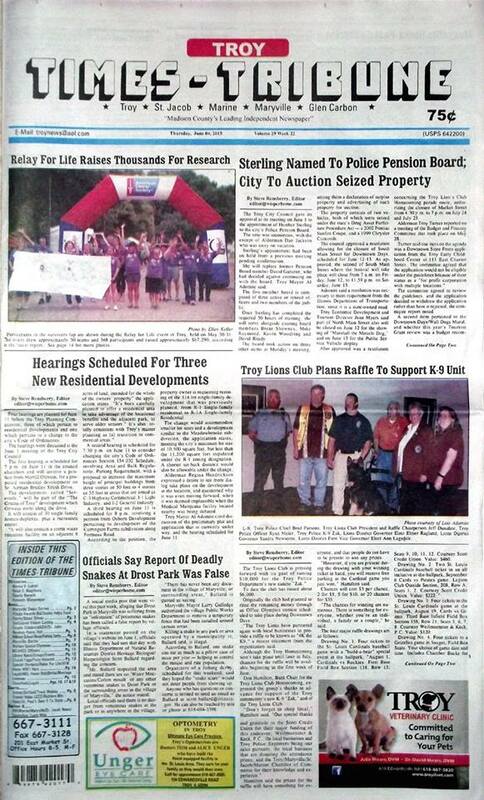 Here's a peak at some of the headlines in this issue: Maryville to Award Bids for Work on Drost/Neptune Improvements, Troy Lions Club Plans Raffle to Support K-9 Unit, MCT Donates Bicycles to Maryville Police, Hearing Scheduled for Three New Residential Developments, Sterling Named to Police Pension Board, City to Auction Seized Property, Officials Say Report of Deadly Snakes was False, Maryville Seeks Parade Entries; plus we have police blotters, news about upcoming events, club and education news, photo spreads on the Relay for Life event, the Cop on a Rooftop fundraiser, and the VFW display on World War I Hero Walter E. Gaultney. 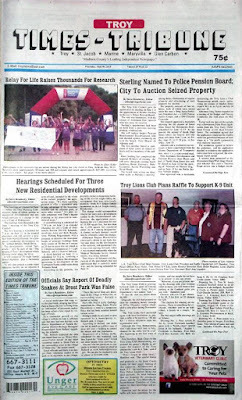 Our “It Happened Here” page features an intriguing story by Ashley Mattingly on a murder that took place in Pin Oak Township many years ago, entitled “Leclaire Man Murdered - The Fate of Nelson Voss.” This issue has obituaries for Norma V. Labrot, Ralph E. Neighbors, Dennis Nemeth, and Kenneth Wiesemeyer.